The Yao who call themselves Mien number more than 2.6 million people and are spread over the southern Chinese province of Guangxi and Yunnan. They also migrated to Vietnam, Laos and Thailand in the 19th century. Many subgroups belong to the Miao-Yao (i.e. Hmong-Mien) group. They are generally named after the colour of their traditional clothes. 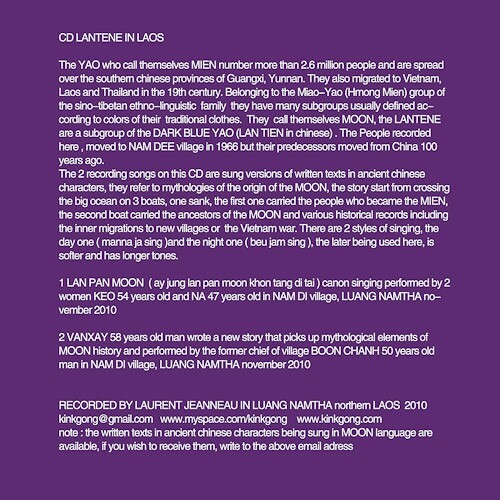 The Lantene who call themselves Moon are a subgroup of the Dark Blue Yao (Lan Tien in Chinese). The people recorded here moved to Nam Dee village in 1966 but their predecessors emigrated from China 100 years ago. Two kind of singing depending on the hour: "manna ja sing" during the day and "beu jam sing" during the night ; the latter being recorded here, with longer and softer tones.